Or maybe you didn’t, and that’s okay. If you indulged a bit too much or fell back into unhealthy habits, today is your opportunity to right the ship. And chances are you don’t need to completely overhaul your routine. Just a few small adjustments can make a big difference. Here are some ideas. Ditch Leftover Holiday Treats – Cookies, half-eaten pies, and gift boxes of chocolate tend to linger long after the ball drops. They had their moment – don’t let them haunt you in the New Year. If you can’t bear the idea of throwing away your aunt’s homemade fudge, wrap it up and stuff it in the freezer. Allow yourself to unthaw ONE piece every once in a while. Take a Booze Break – Champagne toasts, specialty cocktails, spiked cider, Irish coffee… Even if you’re not a big drinker, you may have consumed more alcohol in the past month than you normally do. Take a break for a couple weeks. It will make returning to moderation seem easier, and you’ll find that weekend beer or glass of wine with dinner even more enjoyable. Think about it as less of a cleanse and more of a recalibration. Get One Additional Hour of Sleep – If you spent the last couple weeks burning the candle at both ends, it’s time to prioritize rest and recovery. Eight hours of shut-eye is still the gold standard, but if that seems unrealistic, start by going to bed one hour earlier than you usually do. Set a reminder for 15 to 30 minutes before your bed time. Use that time before bed to wrap up work, turn off electronics, and relax. Set Three CrossFit Goals for 2018 – Whether you’re struggling to get motivated or want to capitalize on the momentum of the New Year, having goals will help you stay focused and consistent with your workouts. 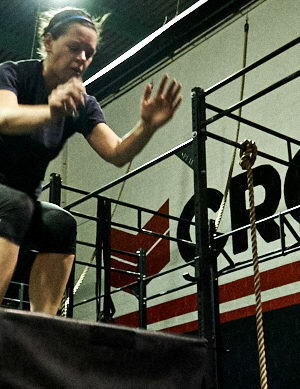 Pick three specific CrossFit goals – PR-ing a benchmark WOD, hitting a new one-rep max, gaining a new skill, for example – and come up with an actionable plan that’s realistic and time-bound. If you need help creating a strategy, chat with one of the coaches. Stay Active Outside the Box – Don’t forget that an “active lifestyle” includes all those hours you spend outside the box. Get your blood pumping by opting for the stairs, taking lunchtime walks, and running errands on foot.